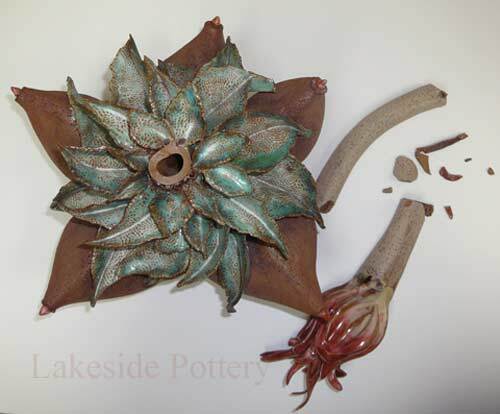 Lakeside Pottery is a ceramic and sculpture repair and restoration facility. 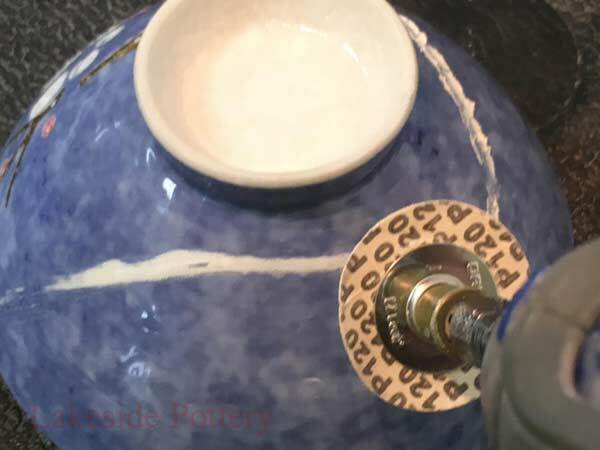 Many ask for advice and one of the most common questions is "Can I use Super or Crazy Glues to fix my broken ceramic or sculpture? How do I choose? It’s so much easier than 2-part epoxies!" There is a misunderstanding about the difference between super glues and epoxy and they are therefore sometimes used interchangeably but, super glues and epoxy adhesives are different and have specific purposes. 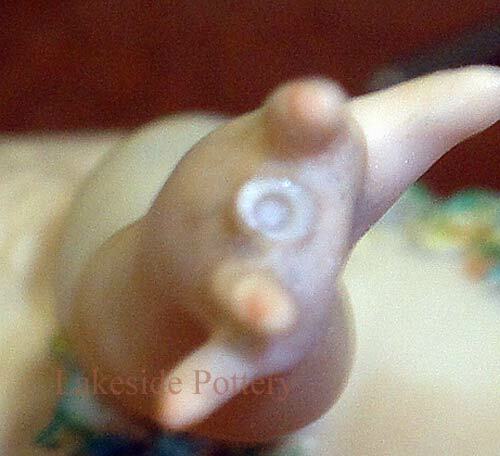 Epoxy or Super Glue for Ceramic or Sculpture Repair? 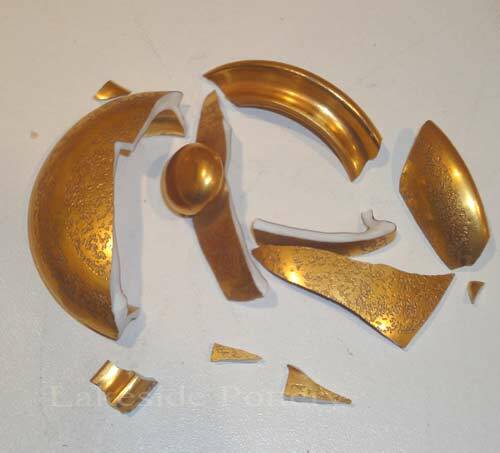 It is important to answer this question before you attempt to repair a broken item that might be valuable. What are the attributes of these glues? What problems might these glues present? 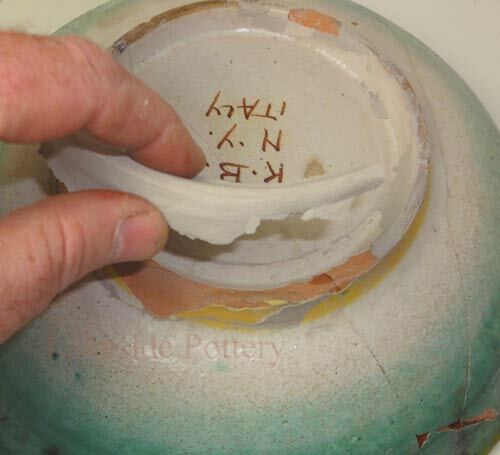 What else do you need to know about these adhesives in repairing broken pottery, ceramic, stone or china? Epoxies have a strong bond, strong structural strength and are better at filling voids between parts. Epoxy consists of two parts, the hardener and the resin that must be combined and mixed well. In some brands, the resin and the hardeners are different colors. Mixing the two generates a third color that can tell you when the two parts are properly mixed. 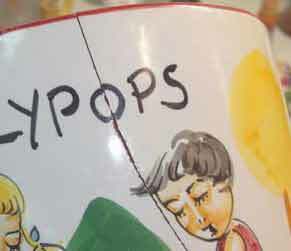 Epoxies come in different sizes, names, containers and squeezing styles. 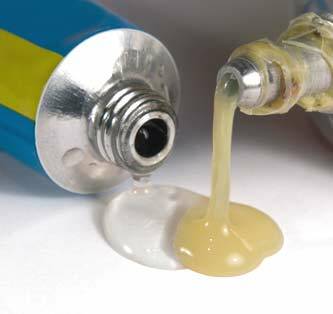 Different epoxies have different purposes  mending, filling and protective coating. 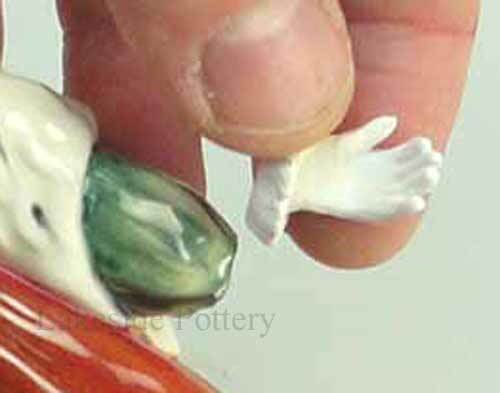 In this write up, we’ll focus on mending epoxies only as compared with super glues. Where to get clear epoxy for ceramic repair? 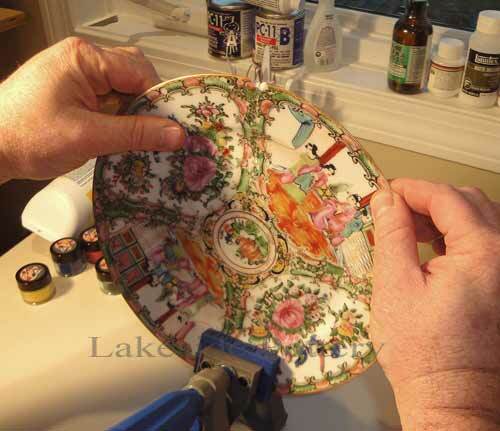 Unlike super glues, mending epoxies are also a gap fillers. 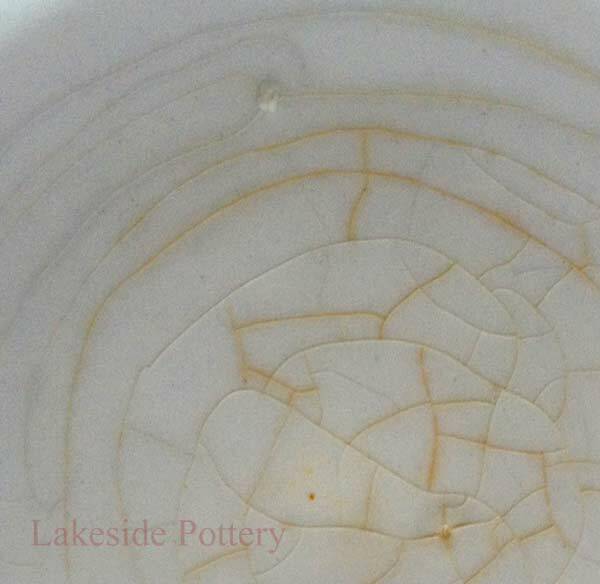 If the broken pieces do not have a perfect fit, epoxy will fill in the gaps while creating a bond between the broken pieces. 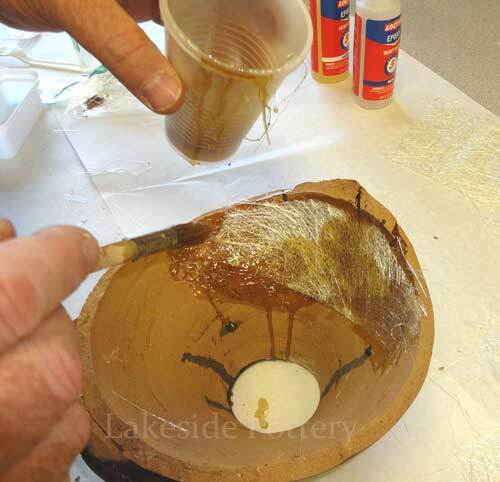 Epoxies require some “body / thickness” between broken pieces to be effective. Meaning, if clamping too hard, the epoxy will squeeze out which will then make it too thin and therefore the bond will be compromised. 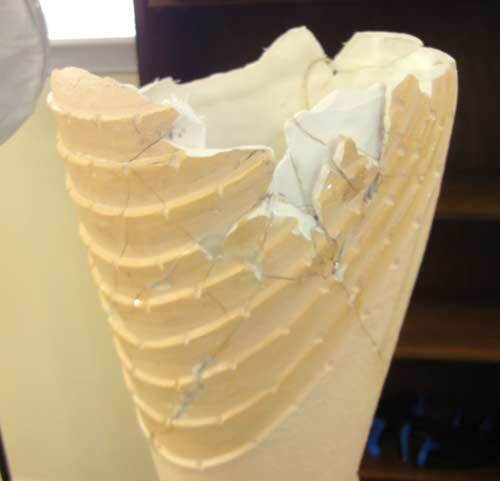 However, when used on multiple broken pieces, the thickness they require between broken pieces could add up to your repaired item shape distortion when mending is completed. Epoxies set from minutes to several hours and holding it in place until it sets can be a challenge. This time depends upon the chemical composition of the hardener. You will want to consider whether quick setting or slow setting epoxy is the most appropriate for your project. Why would you want a slower setting epoxy? 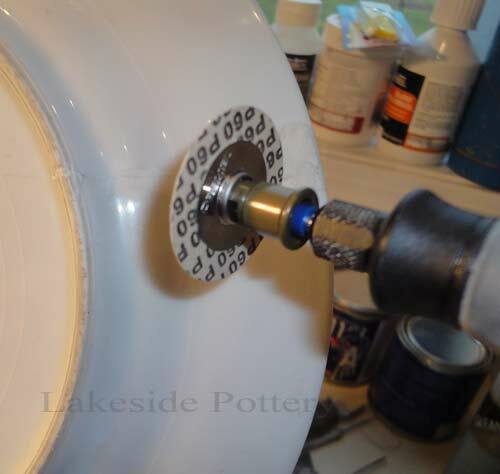 If you are working on small items that can be secured quickly, the quick setting 5 minute epoxy may be your choice. 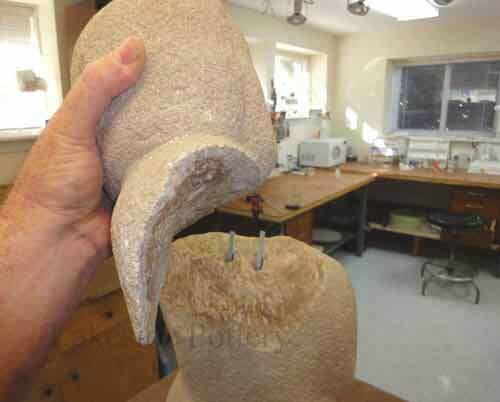 Spreading glue over larger items may require the slower setting product. Five minutes goes by fast! Slower setting epoxy is generally stronger although some brands have recently improved the strength for fast setting epoxies to be as good. This can be good or bad, depending on your use and intent. 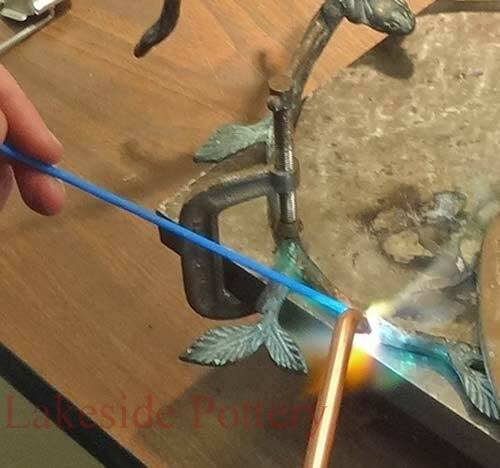 Super glues will separate at a lower temperature - at about 180 degree F. Boiling water on a super glue bond or a touch with a torch flame will separate it. Epoxies will start failing at 200  400 degree F depending on brand and type. Super glues leave a thinner mending line while some epoxies have a color, some are clear and others are yellow but they all leave a thicker line. 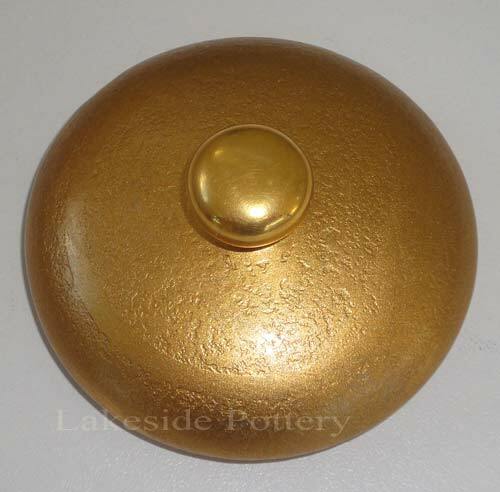 Therefore, consider appearance in your selection of epoxy. If further restoration is planned, (i.e. 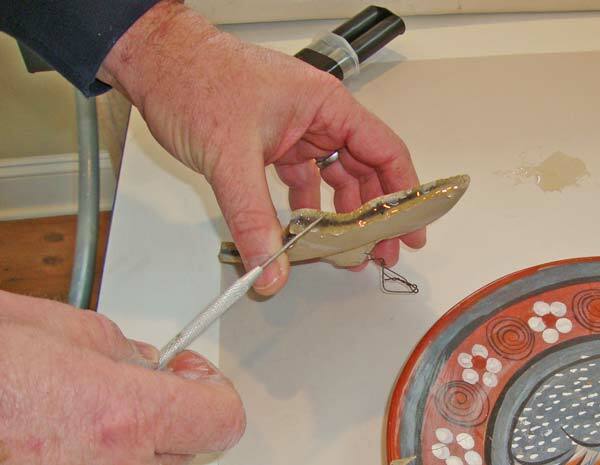 hiding repair lines with fillers, colors and cold glazes), select the stronger epoxy regardless of color. 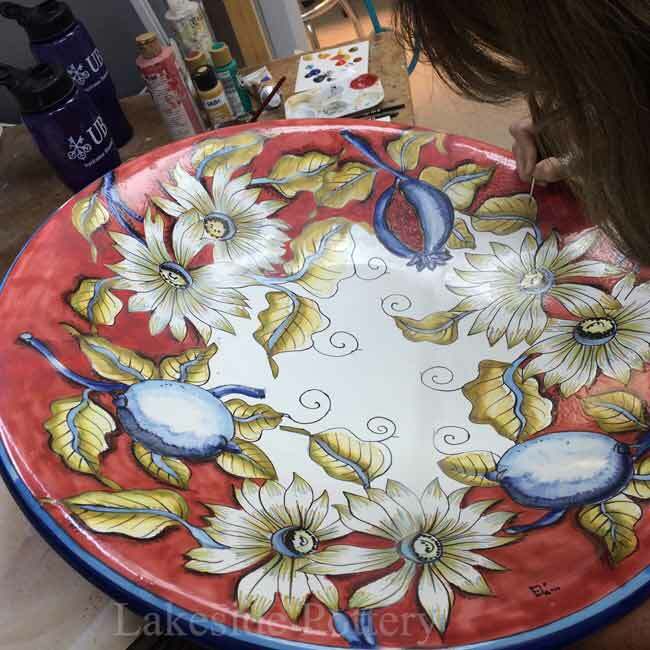 Note: Lakeside Pottery uses 3700 PSI clear epoxy (see link) for most mending applications. 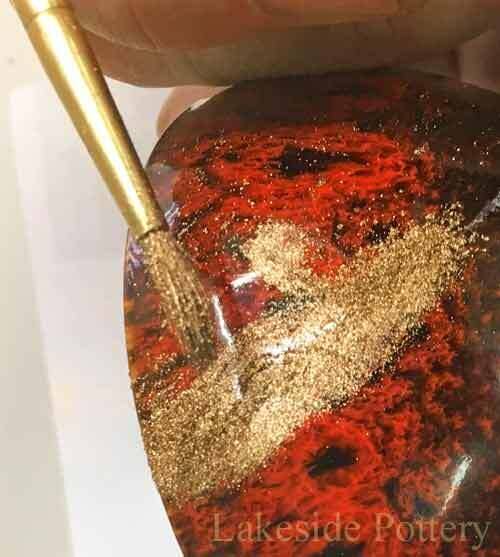 Most clear mending epoxies do yellow with time when exposed to UV light (sun or fluorescent lights) and can impact the quality of the over-painting restoration effort. Cleaning off epoxy with acetone or alcohol before it is set is important to avoid unnecessary labor cleaning once hardened. 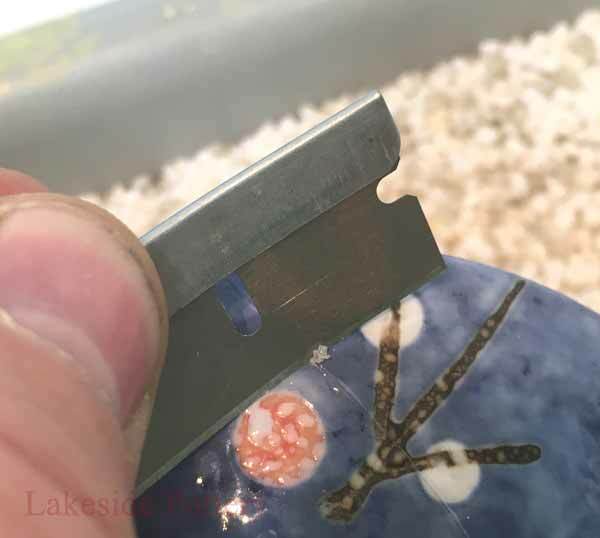 Epoxy will also come off with a blade before it is 100% cured. After setting, epoxy is strong and is more resistant to removal should you leave excess and requires sanding along the glue line. Use a low speed if using a Dremel or grinder when sanding to insure the epoxy does not become overheated (see the heat discussion above). 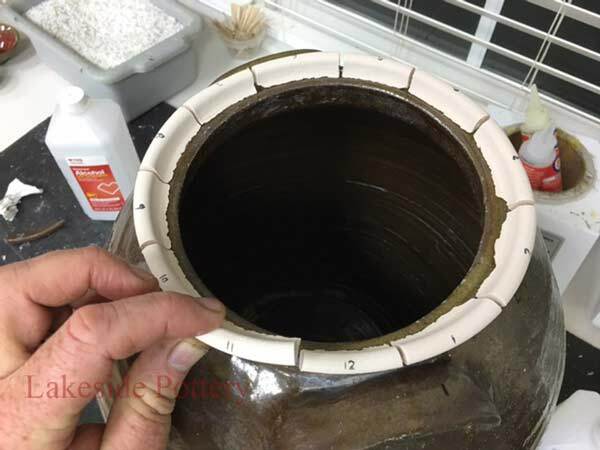 Epoxy spillover on soft ceramic (e.g., terra cotta) is undesirable. 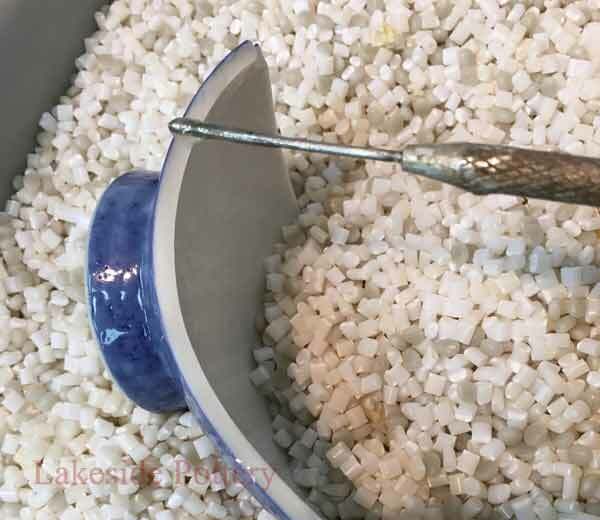 In removing the excess epoxy you will likely scratch soft ceramic or stone. 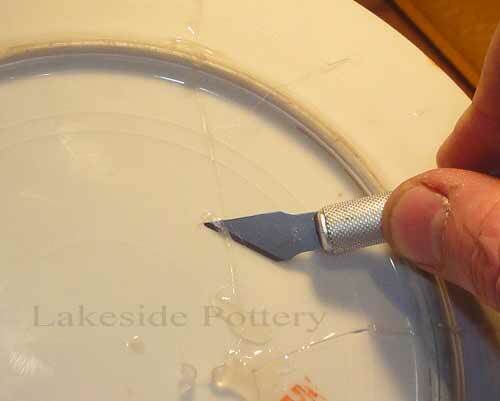 Cleaning off excess epoxy with acetone, alcohol or clearing with a blade before it sets, is important. 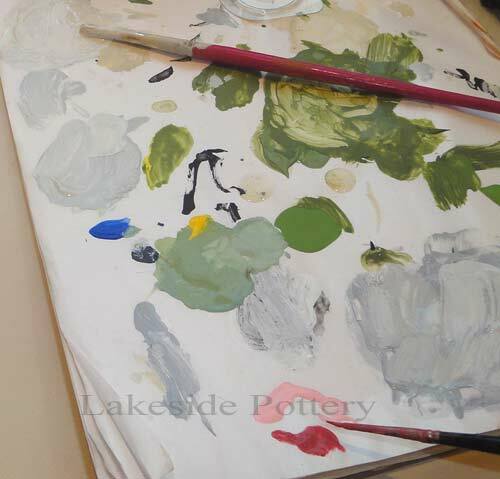 Epoxy leaves the surfaces damaged when one tries to take it off after curing. 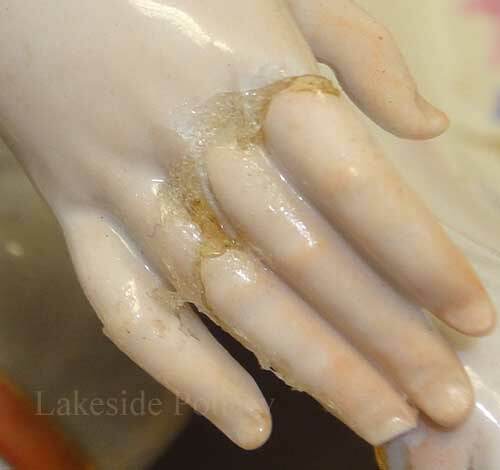 Super glues can be removed, in either liquid or cured state, with acetone. Super glues are acrylic resin that rapidly polymerize in the presence of moisture / water. Because the presence of moisture causes the glue to set, exposure to moisture in the air can cause a tube or bottle of glue to become unusable if opened for too long or not in an air tight bottle. To extend the life of an unopened bottle, keep it in a refrigerator. Epoxies can have a shelf life of a few years. Work in a ventilated area, wear gloves and eye protection. 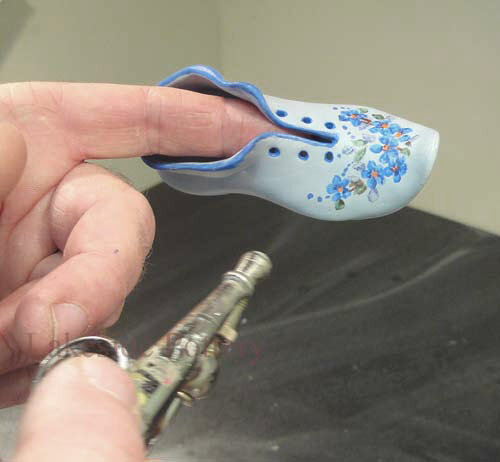 Some users of epoxy can be or develop an allergic reaction to the hardener. Super glues are an eye, nose, and throat irritant. They will also bond tissue almost immediately and are flammable. 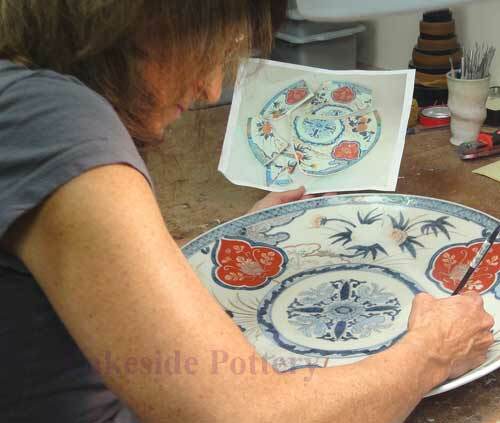 Lakeside Pottery Does not use super glues for ceramic repair and restoration  super glues are just not strong and durable enough. 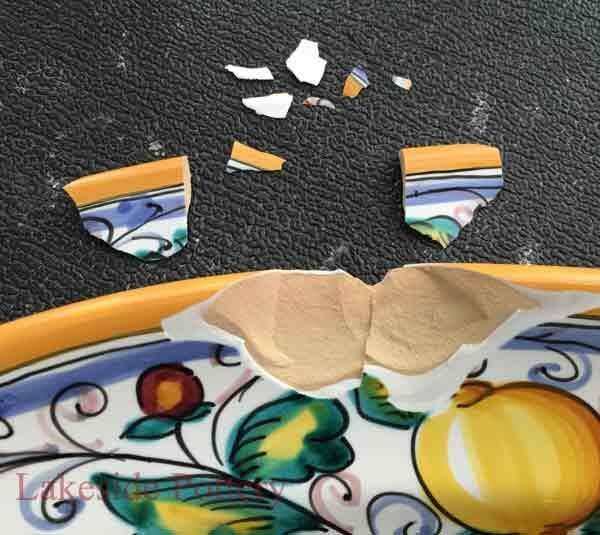 In most of our ceramic restoration, we invest significant effort in hiding the repair and therefore have to make sure the mending longevity is the best possible. We use high-end non-yellowing 5 minute clear epoxies (see link for the brand we do use) in most ceramic repair applications. 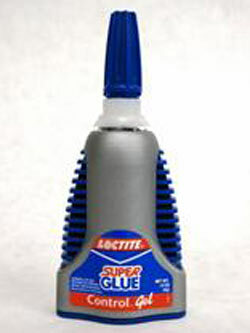 Super glues are probably a good choice for items that are not handled often without long life expectations.